Temple Works is a former flax mill in Holbeck, Leeds, West Yorkshire. 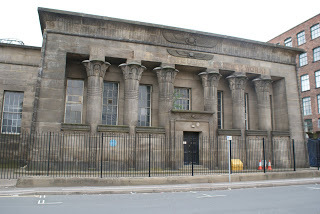 It was built in the Egyptian style by between 1836 and 1840 and is the only Grade I listed building in Holbeck. All seems normal so far, except the mill had quite an unusual feature. The roof was covered with grass to retain humidity, thereby preventing the linen thread from drying out and becoming unmanageable. The only problem with that is that the grass needed to be kept at a reasonable length. Therefore sheep were introduced to graze on the roof of the mill and since sheep can’t use stairs, a hydraulic lift was developed in order to manoeuvre them onto the roof. in 2017 the building was acquired by a developer just a day before it was due to be put up for auction with a starting price of just £1.